For a city that has a handful of extremely recognisable and world famous icons, I didn’t do an awful lot of sightseeing in Rio de Janerio. James had mentioned the cable car ride to Sugarloaf Mountain, a pretty popular tourist attraction on the eastern edge of the city. Though, when I’d probed Tom about it later, he had shrugged, appearing pretty indifferent. “I mean, yeah, it’s a great view,” he said. “It’s one of those things that everyone just does, know you? Almost without thinking about it. If you do go, just make sure it’s on a day when the weather is nice and clear.” I’d taken the advice into account, but there was no denying that on the bright and sunny days, the allure of the beach down the road was far more powerful than any urge to climb a mountain. The same could be said for Christ the Redeemer – the journey to actually get up the mountain to the base of the monument wasn’t a breezy walk in the park, and I can’t admit to having any strong spiritual calling from Jesus to go look at the huge idol up close. So I settled for the glimpses that Tom and I had had of the statue through the clouds on our hike a little closer to home, satisfied that I was probably experiencing a few more interesting things in Brazil than statues and landscapes. But there was one other sight in particular that James had described that had piqued my interest much more than either of the mountains. 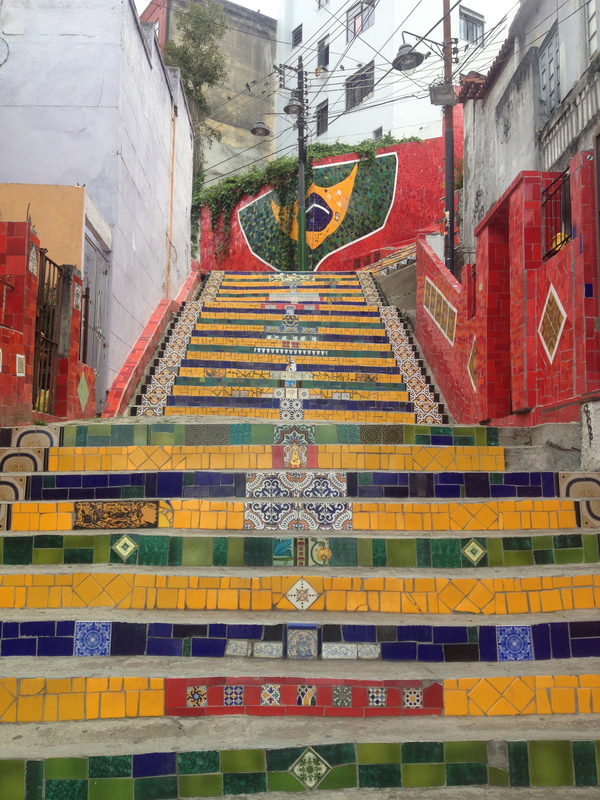 “There’s the steps at Lapa,” he’d said as he rattled off a quick list of things that would be worth seeing, and perhaps it was the fact it was something I’d never actually heard of that made me research the steps and eventually want to go and see them. 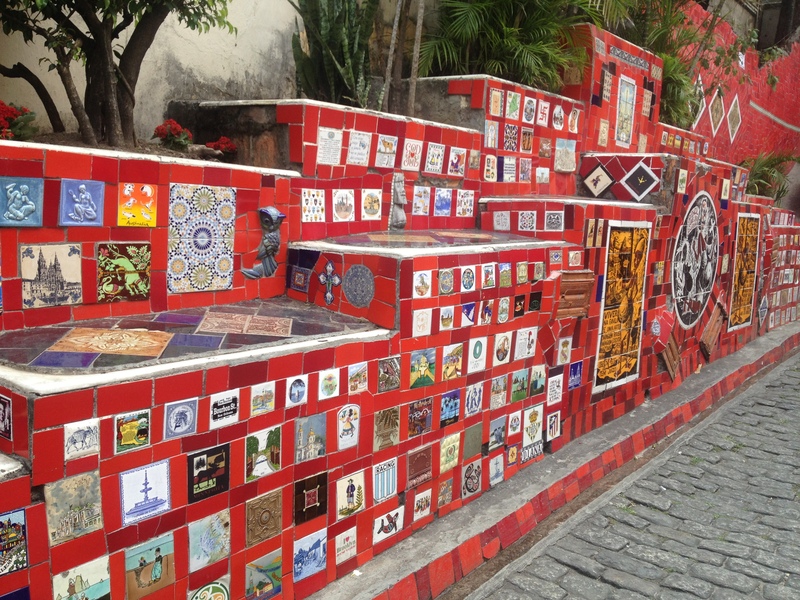 I jumped on Google and did a brief search of some of the other sights in the area – Lapa was a neighbourhood closer to the centre of Rio de Janeiro – and on one of the afternoons where Tom was at work, I set out via the bus and metro to explore a little bit more of the city. 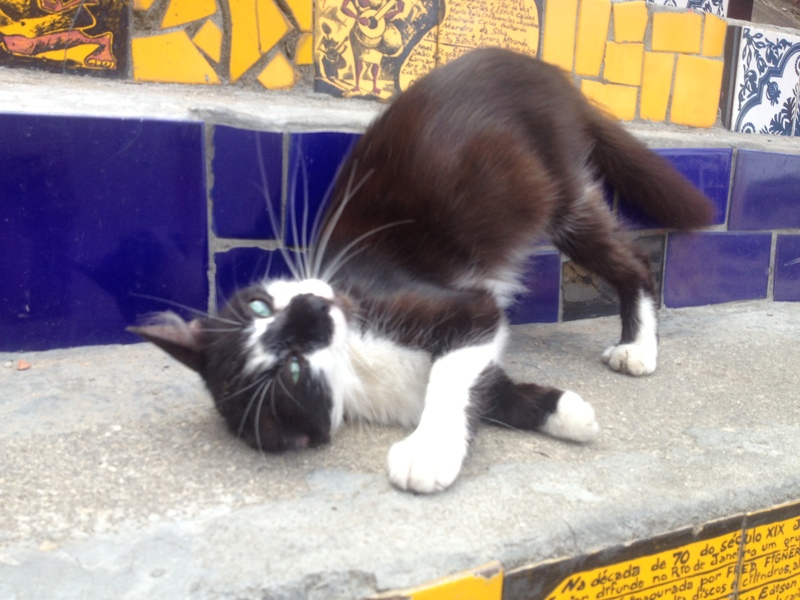 I found Rio to be a curious city because it felt very decentralised. I’m much more familiar with the concept of a city centre, an obvious hub of activity that has a greater population density, is usually a little more expensive than the rest of the city, and has lots of things to see and do and entertain the tourists. But as soon as I stepped off the metro and emerged into the more central streets of Rio, I realised this wasn’t the case. The touristic focus of the city is by and large the coastal areas, and the regions that have the gorgeous beaches and natural beauty within the landscapes. 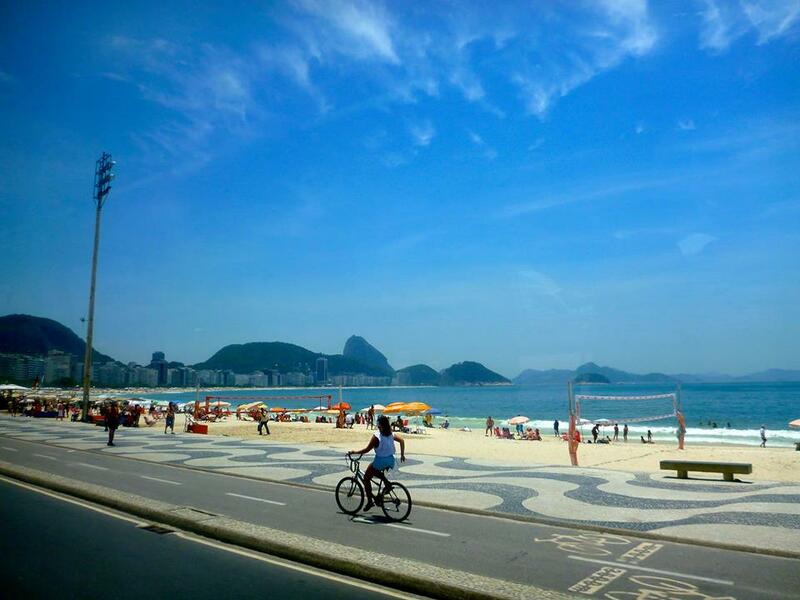 That’s what people want to do and see when they come to Rio – I too had been primarily more interested in catching some rays and working on my tan than I ever had been about the sights I was about to visit. Now, Rio is a pretty big city, so maybe there was a more accurate, central hub that I didn’t know about. To be fair, most of the city it actually based long the coast, around the mountains and the landscapes, and so the “centre” really just seemed to be the midpoint between the northern and southern parts of the coast. But the area I was in looked not far off being a ghost town. A lot of the buildings looked particularly old and run down, graffiti and litter were present – not overwhelmingly, but consistently – and I was very quickly introduced to another far less glamorous side of the city, which I had a feeling didn’t see half as many tourists as the beaches at Copacabana or Ipanema. 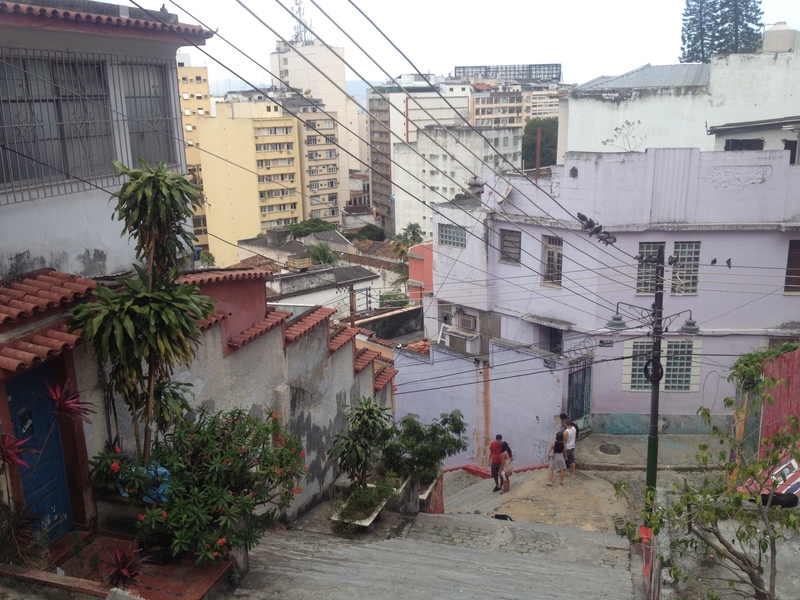 It told a different story, a toned down version of the rife poverty that existed in the favelas over the hill, the concentration of the Brazilian slums. 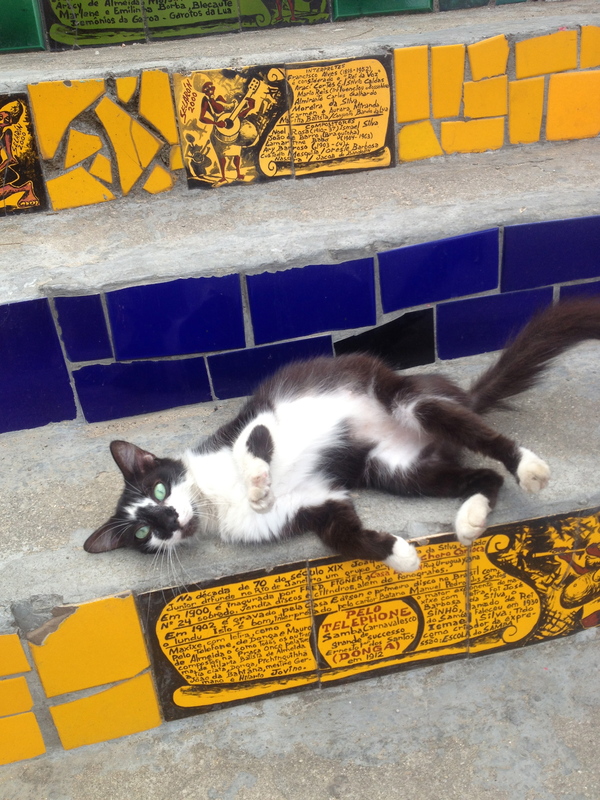 It was actually quite confronting, and for the first time during my stay in Rio I actually felt the mild presence of danger and the need for a little more caution than usual – a fear that I had been secretly harbouring about the city yet had never before now been actualised. But I kept my wits about me and moved on, taking a few photographs of the significant buildings and trying me best to not look too much like an ignorant tourist. 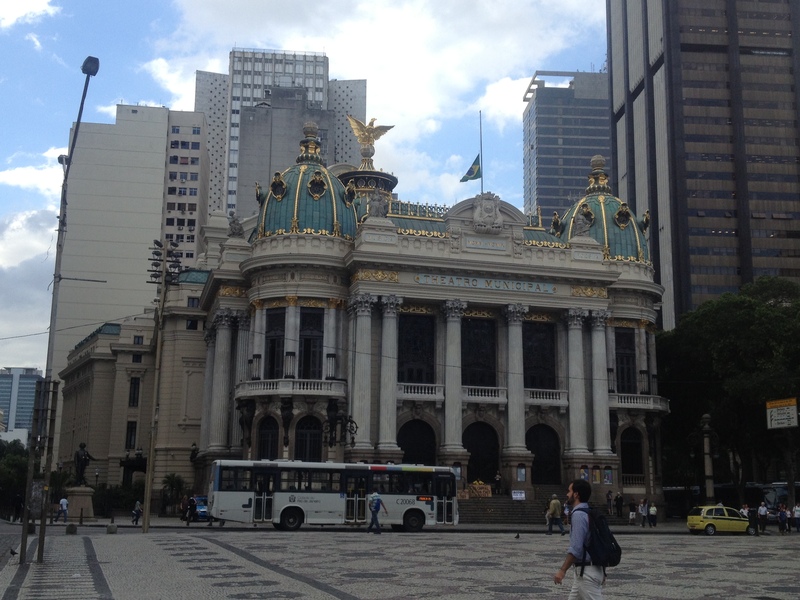 Firstly there was the Teatro Municipal, considered one of the most important and beautiful theatres in the whole of Brazil. 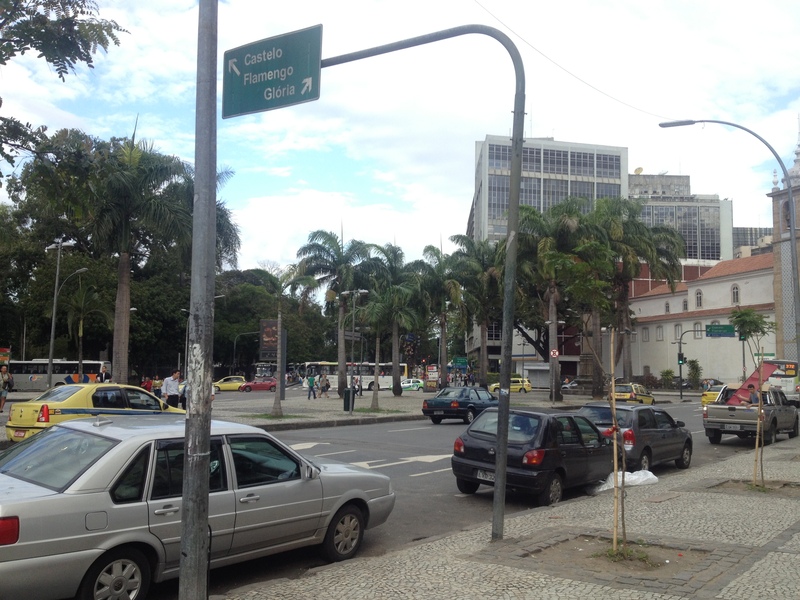 The relatively quiet centre of Rio. After that I made my way further west over to Lapa, where there were two more sights that I had read about. 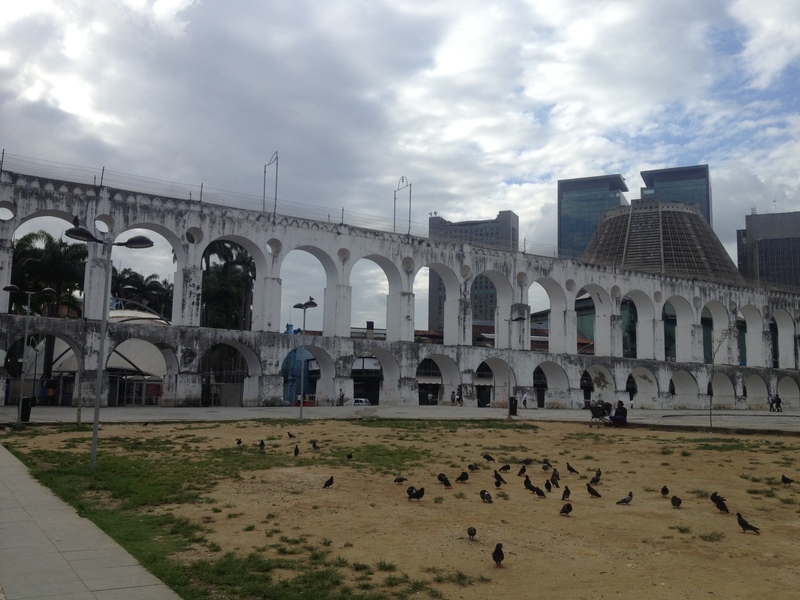 The first was the Arches of Lapa: the ancient Carioca Aqueduct. When I first read about them, I assumed I had just misheard James say ‘steps’, but they were actually something else entirely. I have to admit, I was expecting a little more than what I saw. To be fair, there was nothing misleading about the name – the were definitely arches. However, they’re been described as great architectural feat, a landmark of the city, and I couldn’t help but feel a little disappointed when I discovered the building looking particularly dirty on one end, as though it had suffered some major neglect. Although in the end it all ended up feeling rather fitting for the ghost town vibe I was starting to get from the area. Arcos da Lapa: the arches of Lapa. But as I followed my directions down a few small side streets, levels of fear and uncertainty slightly but gradually rising, I turned a corner and instantly felt like I was in another city, with an entirely different mood and atmosphere. 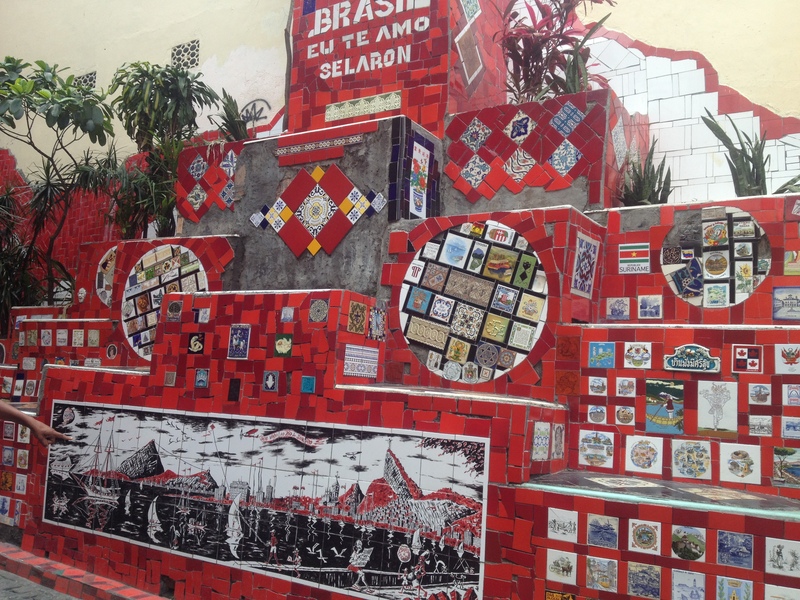 Escadaria Selarón – Selarón’s Staircase, or the Steps of Lapa – loomed ahead of me, an explosion of colour that appeared seemingly out of nowhere in the otherwise dank and drab corner of the city. The entire staircase was decorated with an array of coloured materials. There was so much intricate detail in the ceramic installation. Honestly, I hadn’t done that much research into what the steps actually were, so I was completely blown away when I stumbled across them. The entire staircase had essentially been turned into an artwork, with barely a patch of free cement that wasn’t adorned by a tile or ceramic in some way. There were words in the steps, there were flags, there were pictures – it was such a complex and diverse range of colours and images, there was nothing you could do but slowly ascend the staircase while marvelling at the walls around you, taking care to not trip up them in the process. There was a substantially larger amount of tourists on the steps, too – it seems as though this is one of the few attractions that people venture out this way to actually visit. I took my time picking out some fellow tourists who seemed trustworthy enough, and asked them to take my picture on the steps. Other tourists marvelling a the ceramic artwork. 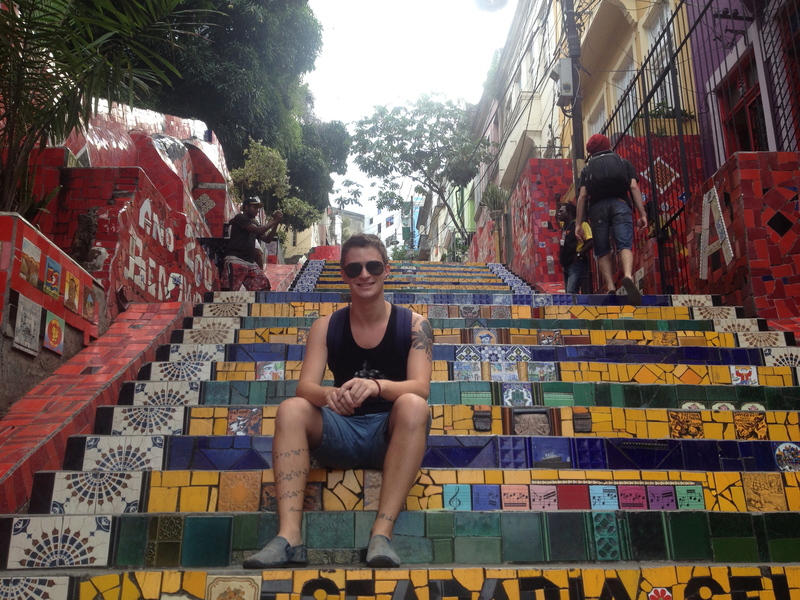 Sitting on the steps of Lapa. It was actually quite a long staircase, and as I climbed further I realised that the staircase was actually a street. There were houses along either side, front doors opening directly onto the staircase, and I few times I actually noticed Brazilian families coming and going from their homes. I wondered what it must be like to literally live on a tourist attraction – frustrating at times, but surely a beautiful backdrop to spend even the most relaxed and casual days of your life. When I reached the top, it was interesting to gaze back down the steps and realise how unremarkable they looked from above. Almost all of the tiled surfaces faced downwards, and you could only really be confronted with all the colours as you climbed the staircase. I sat there at the top of the steps, partly to sit and marvel at the complexity and beauty of the whole thing, and also partly because I had discovered an adorable little stray cat which I couldn’t stop photographing. The view from the top of the steps. The cute little stray that I stumbled across. Seriously, he was probably the highlight of my day. The steps were really interesting though, and something I was so glad I had taken the time and effort to go and see. 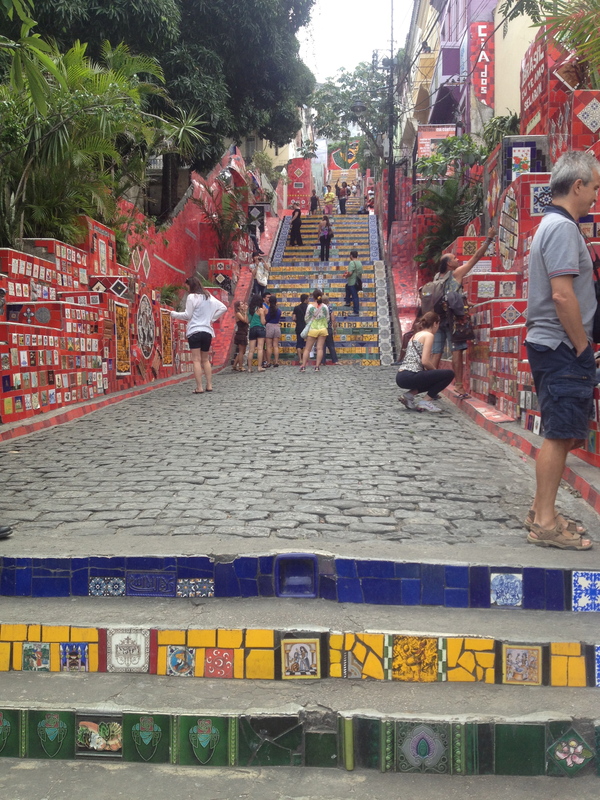 Now, whenever I see a movie that’s set in Brazil and there is a visual of the steps at Lapa, no matter how brief or insignificant, I can’t help but shout out “Hey, I’ve been there!” to anyone who will listen. It wasn’t a hugely popular attraction, such as, say, the Eiffel Tower, and I think the fact that there were less people made it even more memorable, and something that I really will carry with me for the rest of my life. 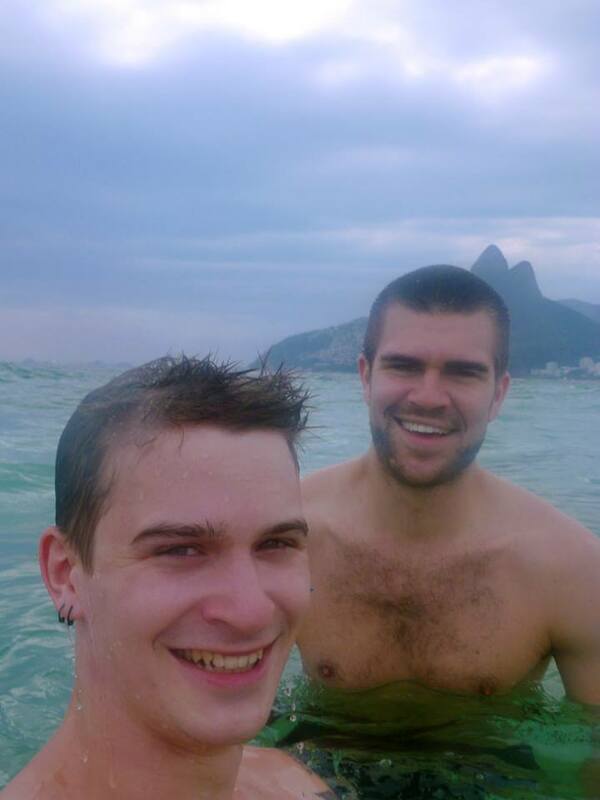 That day was the only real sightseeing that I did while I was in Rio. After seven months on the road, it’s a little difficult to muster up the enthusiasm for that kind of thing all the time, but I felt satisfied with what I had managed to see. The rest of the sunny days I spent hanging out with Tom, going to the beach with him and James, and for the most part just relaxing and taking it easy. People sometimes underestimate how taxing on your mind and body travelling can be. Sure, it’s essentially an extended holiday, but you’re constantly moving your body around from one unfamiliar environment to the next, and all the new things you see and learn about and discover can build up to overwhelm your mind. Rio provided the perfect opportunity for me to just kick back, soak up the sun, sand and sea, and really not have a care in the world. 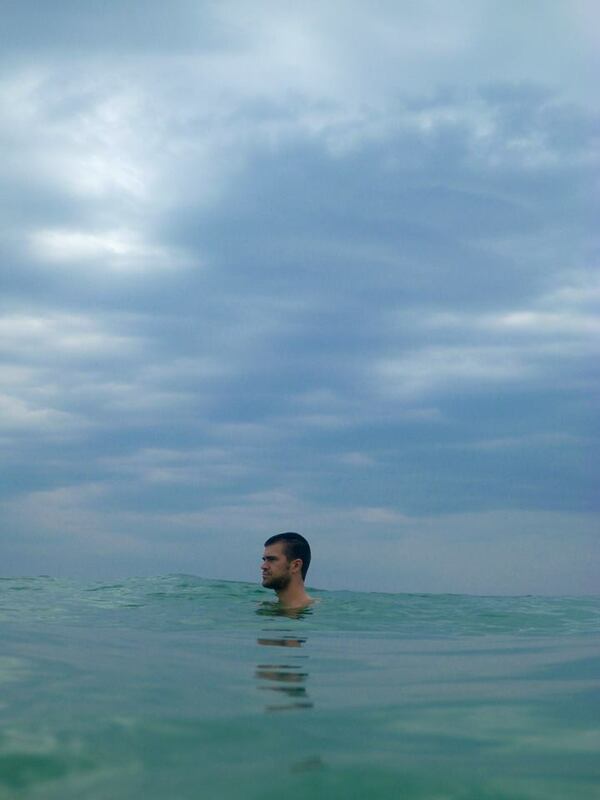 Tom in the ocean, taken with his waterproof camera. 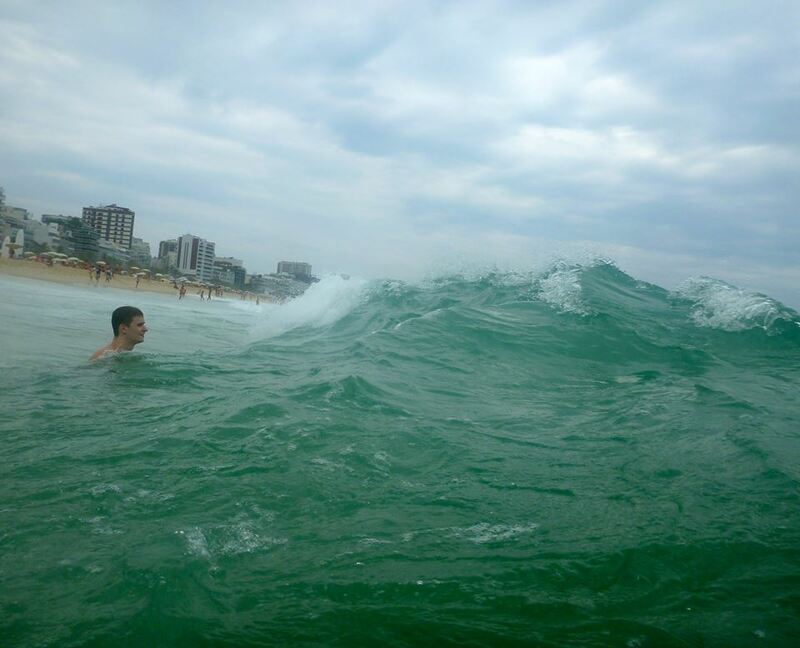 And there’s me, diving into the surf. 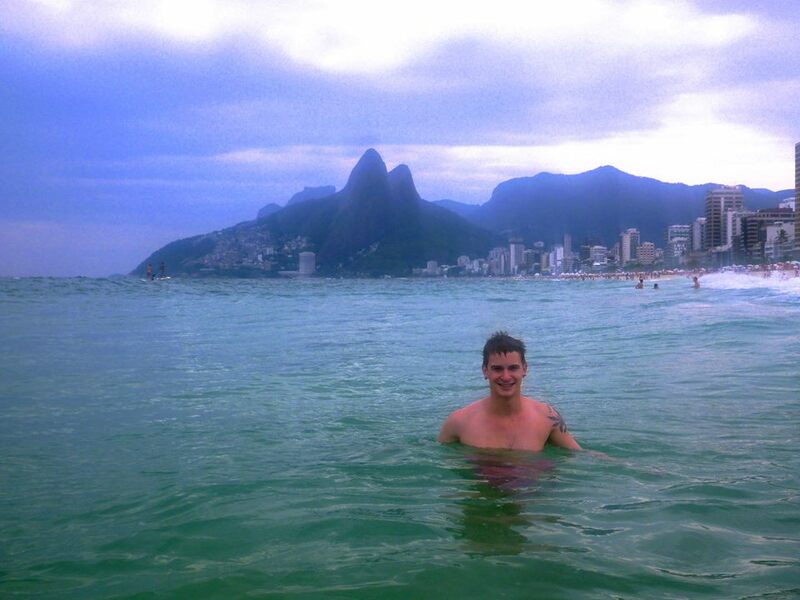 Swimming at Ipanema with the scenery behind me. And of course, the experience wouldn’t be complete without a selfie. When the sun comes out, Rio de Janerio really does become, in my opinion, one of the most beautiful cities I’ve ever visited. The first farewell was to Melissa, and the apartment that I had, for all intents and purposes, been calling home for the last six weeks. They say time flies when you’re having fun, but honestly, so much had happened since I first stepped off the subway in Grand Central Station that sometimes it felt like a lifetime ago. And while I’m sure Melissa was ready to finally have her very own apartment completely to herself for the first time since she had moved in, we shared an emotional goodbye with lots of long hugs and me being unable to adequately express my gratitude for everything that she has done for me. “Really, it was no trouble at all. I’ve loved having you here! It’s gonna be weird not having you around,” she said with a beaming smile. “As long as I’m here, you’ve always got a home in New York City.” To this day, I’m still amazed by the endless depth of her generosity. I gathered up my things and said goodbye for the final time, and even said a final farewell to the doorman (“I’m leaving for good this time, I promise!“) as I made my way back to Grand Central Station. However, JFK Airport was not my destination today. I still had one last night in New York, and I was going to spend it with an old friend who I hadn’t seen in many months: my father. Back when I was staying with Mike in Washington, I got a phone call in the middle of the day. I didn’t get a lot of calls while I was on the road, since nothing was ever usually that urgent that it required them, but I remember being extremely surprised to see that it was my father calling. When you get long distance phone falls from your family, sometimes it’s only natural to expect the worst, so I was a little hesitant when I answered the phone. I couldn’t help but chuckle. “No, Dad. It’s 1pm.” Far from being the bearer of bad news, my dad was just on his way home from having some drinks with his work associates. Uncharacteristically, he’d had enough to push him into a state of being relatively tipsy, but rather than being clumsy or slurring his words, he spoke in a rather eloquent and poetic manner, an extension of his usual well-composed self. “I just called your mother to let her know where I was and that I’m on my way home,” he told me. “But it’s late here, and… I just felt that I wanted to speak to somebody that I love.” I swear I teared up a little when I heard that. If we’d been in the same time zone I assume I would have been a little annoyed to be receiving drunk dials in such a manner, but when my own father – who I hadn’t seen in approximately 5 months – calls you from the other side of the world for no reason other than to tell you that he loves you… well, it was a little special. I take after my father in quite a few ways. We’re both deep thinkers and can get extremely philosophical. I mean, we can all get philosophical after a few drinks, but my dad’s one of the few people I know who can still hold a substantial and legitimate conversation about the meaning of life after one too many nips of whiskey. I wish I could say the same for myself – I guess he’s a role model to me in that regard… and among other things, of course. We spoke for almost an hour, and if I closed my eyes I could imagine us sitting around the dining room table in my old family home, bottle of scotch open in front of us, having the same, life-affirming conversation. With a substantial amount of time still left on my journey, it was a beautiful experience that was able to keep at bay any homesickness that might have been creeping into my subconscious. It couldn’t have been any more than a month later that I was hopping onto the NYC subway to to head over to the Hell’s Kitchen, where I’d be sharing a hotel room with my dad that evening. He was in the USA as part of a business trip, but had managed to set aside a night in New York for some personal time to see UFO, a beloved rock band of his youth, playing a live gig. When he’d called me up that afternoon in Washington and told me the date of the one night he’d be in New York, it seemed like the perfect coincidence that that was the night before I flew out of the US and down to Brazil. When he’d asked if I wanted to come to the concert and spend some time with him, I immediately said yes, despite not having any idea who UFO was. It certainly wasn’t how I ever imagined my last night in New York would look like, but when things like that work out so neatly, it seems wrong not to take the opportunity to make it happen. So I rocked up to the Holiday Inn in west Manhattan, where the reception staff were apparently expecting me. My dad arrived a few hours later, and after a brief and jovial reunion we set out to have a bite to eat and a drink or two before the concert that evening. 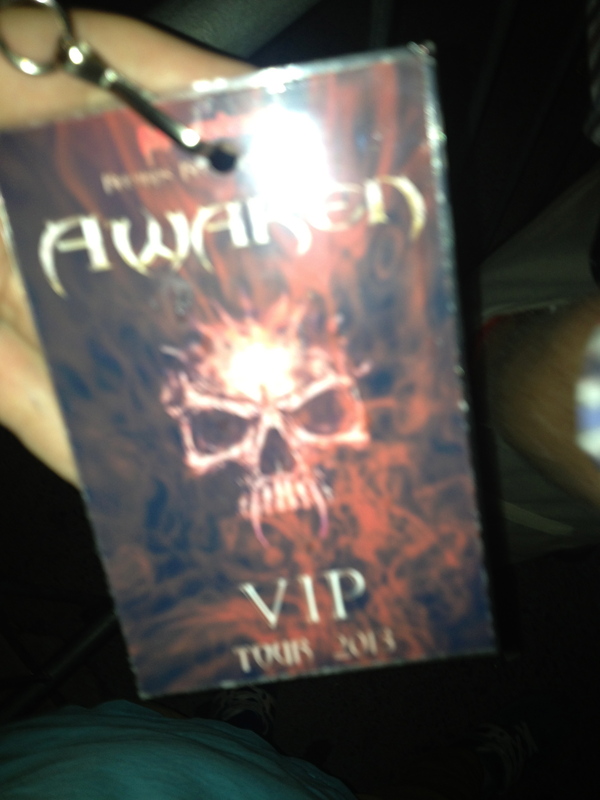 My dad had booked a VIP pass to the concert, which apparently involved some kind of backstage tour and meet and greet with the band. When we rocked up to the venue, I suppressed a little chuckle under my breath when I realised I’d already had my own behind-the-scenes tour of the place – it was the same venue that the VIVA party had been in. We were early, so there was no queue to speak of, and the doors that I knew to be an entrance to the main room of the building were wide open. When we couldn’t see any sign of an official person waiting for us, my dad took it upon himself to go inside and see what was happening for himself. “Dad! Wait… what… where are you… Oh God,” I sighed, having no choice but to follow him. There were what appeared to be a bunch of roadies setting up equipment and running sound checks on the the guitars and drums. We stood around for longer than I thought should have been possible before someone noticed us and asked if they could help us. When my dad explained the VIP ticket and what he was doing here, the man stared back at us blankly. “Oh..kay…” he said, trying to make some kind of sense of the information my dad has given him. “Honestly, I don’t know anything about it, but let me see if I can find someone who does.” We waited patiently, and I exchanged a look with my dad. He just shrugged and rolled his eyes. “You’ve gotta take a bit of initiative sometimes, Robert. Otherwise we’d still be waiting outside for someone who clearly wasn’t looking for us.” Normally I would have been a little irked that this was turning into a lecture, but I have to admit, he had a point. He’s a smart man, my father, so I let him have that one. Eventually the guy who we spoke to originally came back, with a sheepish, timid smile that looked unbelievably out of place of a guy who looked as though he could be the drummer in a metal band. As it turns out, I was pretty close. He was the lead singer of the first opening act, a band called Awaken, and he seemed have taken his inability to help us to heart. “I’m sorry guys, it’s a bit of a mess back here right now. I’m not really sure what’s going on with the guys from UFO.” My dad explained the VIP ticket thing again, throwing in that’d he’d only managed to get a regular ticket for me and asked if I’d be able to still join. From the looks of what was going on, it didn’t seem like it would have been a problem – nothing here was too official or professional. But there didn’t even appear to be any kind of meet and greet, or any VIP experience at all. So we walked away from the whole thing a little confused, but not empty-handed. “All you have to do it look like you know what you’re talking about,” my dad said with a chuckle, “and people will respond to that.” I guess there’s still a lesson or two in life I can still learn from my old man. My VIP pass, courtesy of one very persuasive father. We returned to the venue later to see a line of fans dressed primarily in black lining up along the edge of the building. Dad and I flashed our VIP passes. “We’re with the band,” my dad said with a laugh as the bouncers inspected them, and I suppressed a groan of mild embarrassment. We were waved through to a foyer area, where we were required to present our actual tickets, but then once I was inside no one gave much notice to which kind of ticket I’d had – I had a VIP pass from the band! There was a small roped off VIP section, so dad and I got a drink each and sat down in it, just because we could. We watched a security guard come around and usher people who weren’t supposed to be there out of the area, but he left us well alone when we showed him our passes. It was all pretty hilarious, to be honest. I can’t say I’ve ever really been a VIP at any kind of event, but I had a feeling this kind of magic that my dad worked landed him in similar situations often enough. 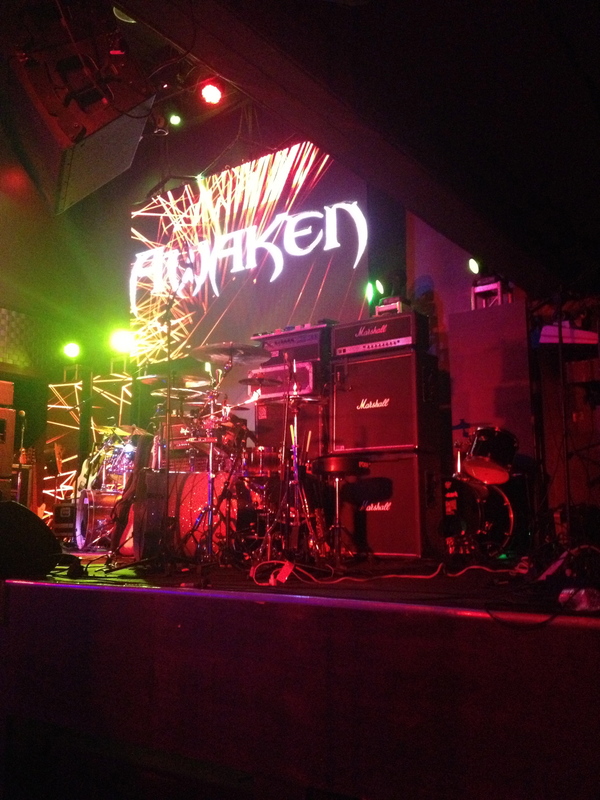 Awaken playing their opening set. The rest of the night was pretty standard – we saw our mates from Awaken play, and even had a chat with them after they’d played their set, and eventually UFO came on. I didn’t know a single song, but they were a crew of old men who still knew how to play their instruments after all these years, and they put on a really good show. It was an enjoyable evening, and I’m glad I’d chosen to take the time on my final night in New York to hang out with my dad. I guess it took being on the road for was long as I had been, and being away from them for so long, for me to really appreciate just how much I love my family, and how much they love me. 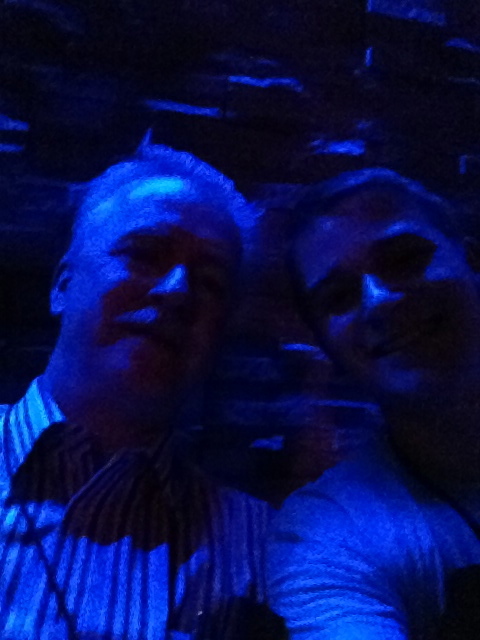 My dad and I in the VIP area. 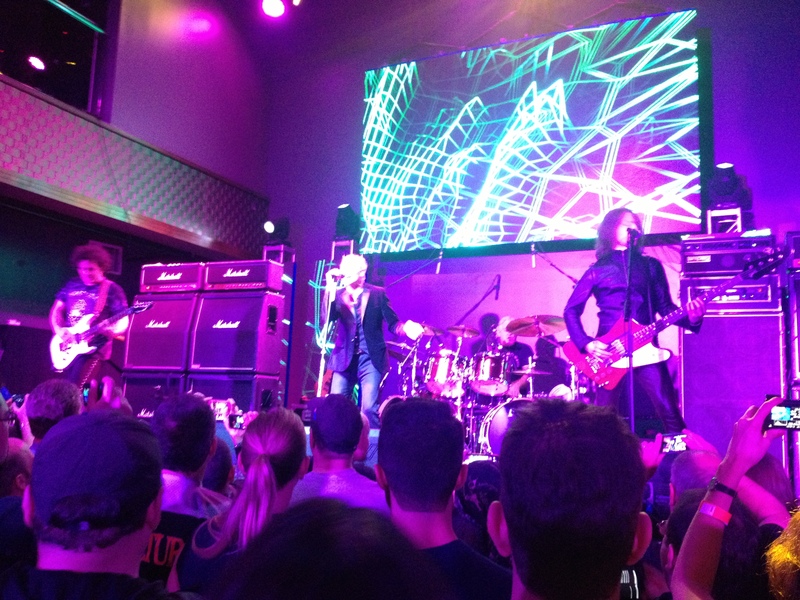 The main event – UFO. My dad had to leave New York quite early the next morning, but we wandered down the streets of Hell’s Kitchen to get a slice of pizza before heading back to the hotel. I got up to say goodbye in the morning, but I was probably a little too tired to be emotional. “Stay safe, call if you ever need anything, and I’ll see you in the new year,” he said with a hug and a pat on the back, and then he was gone. Because that was what happened the last time I saw him – an abrupt, awkward leap off the subway, completely convinced I would see him again before leaving New York. 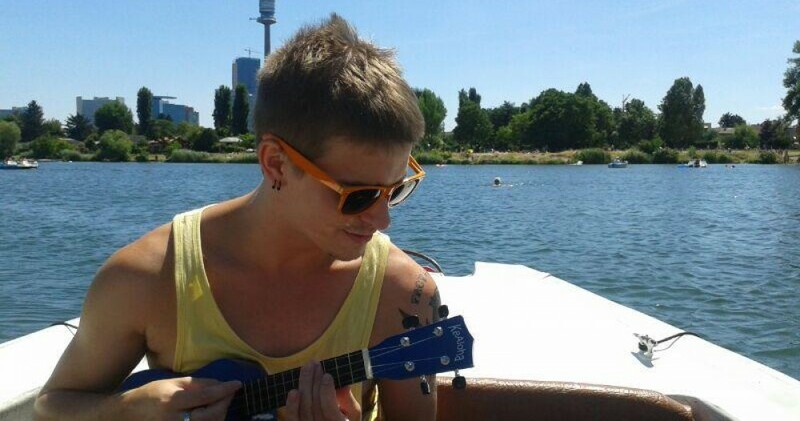 The fact that it really upset me that I didn’t see him again… well, in retrospect I can’t really put my finger on it. He had been a really enchanting person to meet – a diamond in the rough in an almost literal sense, when you consider where exactly we met in Berlin – and I think I had carried that enchantment with me when I had continued on my journey. Knowing that I actually was going to see him again in New York had kept whatever romantic spark we had had alive in my mind, but to have that final goodbye that I had been building up to ripped away from me so easily was, in short, devastating. I probably cried as hard as I would have at an emotional goodbye at the airport, but being alone was an extra twist of the knife – an extra knot in my stomach. But that’s the way the cookie crumbles, and after the brief moment of heartache I remembered that I’d been getting quite good at being alone over the past five months. But it was in New York City, baby – New York City that I had really experienced it all. Many people say it’s the greatest city on Earth. I think that’s a very subjective title to award any city, but I have to admit, I understand why the Big Apple is a big contender. It exists as the epicentre of the world in countless stories and works of fiction just as much as it does in the minds and hearts of people all over the world. I’d both loved and hated New York, for all of it’s beauty, excitement, danger and wonder, and the city had both loved me back and crushed me at the same time. It was those experiences of that I was living for – the ones that test you, amaze you, open your eyes, open your heart, and eventually morph you into a better person. I reflected on all of this on my long public transport journey through Queens and out to the airport. 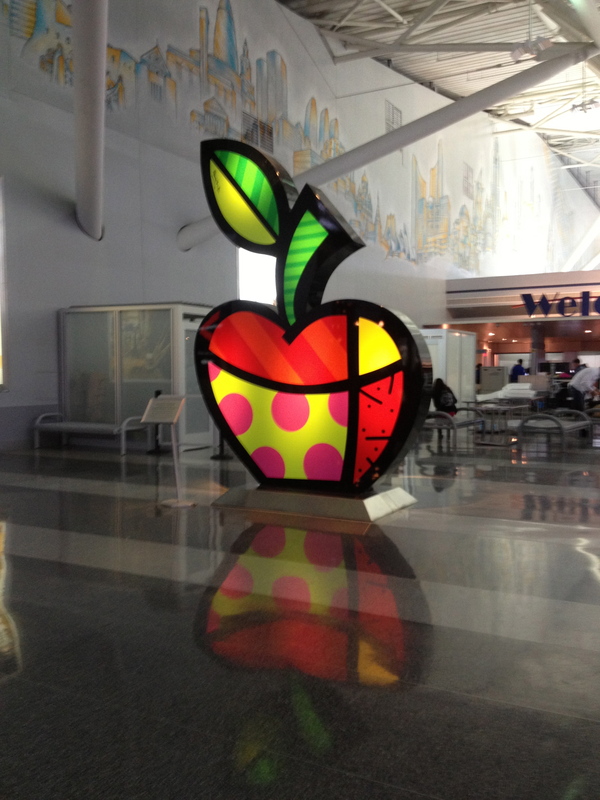 For all it’s worthy and memorable experiences, it was time to finally move on from the Big Apple. Thanks for having me, New York: I’m sure I’ll see you again soon.